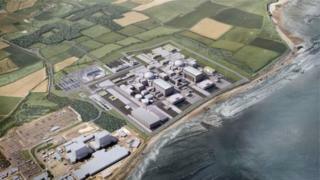 The threat of industrial action by workers building the Hinkley Point nuclear power station has been averted due to an interim pay deal. Unite union members had warned of strikes over bonus pay, but it has now been agreed that interim bonuses will be paid out until the end of August. A long-term settlement will also be considered by union officials and EDF Energy, which is behind the scheme. Hinkley Point C is expected to be operational in 2025. Unite officer, Jerry Swain, said the interim agreement was "crucial" in providing a "breathing space" and "creating the opportunity for a long-term solution". "I am pleased that following consultation with our stewards and members that we have been able to agree a clear path forward," he said. "And that the prospect of industrial action, which is always a last resort, can be taken off the agenda in order to allow the panel to deliberate." Nigel Cann, of EDF, said it has created a "very competitive reward structure" for its workforce. "We are pleased that these interim arrangements allow constructive dialogue to continue to finalise this important agreement," he said. "Unite has been a constructive partner in the discussions to date and I look forward to this continuing throughout the construction of the Hinkley Point C power station."